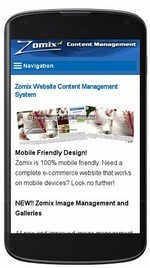 Today it's a MUST to have a Mobile friendly, or 'Reactive' website. Google has started ranking sites based on wether the site is Mobile Friendly or not. What does this mean? When google has multi results to show for a search and you're in that list, if your site is Mobile Friendly your site will apear before sites that are not. This can make all the difference in getting users or customers to your site. What is a 'Reactive Site'? A Reactive site is a site that change 'change' depending on what type or size of device it's being viewed on. So if a user is view your site on his/her mobile phone, they will have a hassel free experence with easy to use navigation and fonts/text that's readable on that phone or tablet. While at the same time allowing the site to expand when being used on your typical desktop browser. Racine-Web Design & Hosting specializes in designing, building and hosting e-Commerce ready Dynamic Web Sites and shopping carts with built in web based content management . Whether your a company or individual, Web Site Design is a critical concern for any one, even more so if your web site represents your business. If your website does not look professional, your visitors will have the same impression about you. Racine-Web Design specializes in providing a professional and attractive web site that reflects your company in a positive image. Your business can command a presence on the World Wide Web with a easy to use web administration interface for content management. This interface allows Racine-web Design to provide you with a dynamic website that anyone can maintain and update from within your company. Racine-Web design can also integrate your custom database on-line or setup a new database for you to use with your website. From on-line inventory to custom information, Racine-web Design can take care of your on-line database needs. Now is the time to take advantage of the exciting services Racine-Web Design & Hosting can provide for you and your business.